At Reitmeier, we pride ourselves on being one of the most sought-after HVAC employers – in fact, we were ranked as the Best Contractor to Work for by ACHR News and recognized by Oregon’s SAIF Corporation due to our progressive practices. Mentorship can be one of the most powerful tools in the HVAC industry – which is why we created Reitmeier University, a two-year continuing education program developed to train and certify new employees in commercial HVAC services. A new paradigm for our industry, we founded the program not only to foster institutional knowledge, but also to orient team members to the Reitmeier way and culture. In addition to traditional classroom instruction, each new hire is partnered with an experienced Senior Level Technician in a structured mentorship – this model helps employees to share best practices for tackling real-world HVAC issues. We believe in doing everything we can to keep our team healthy and happy, and our benefits reflect this dedication: Reitmeier provides 100-percent coverage for our workers’ health care, and nearly 75-percent coverage for all dependents. 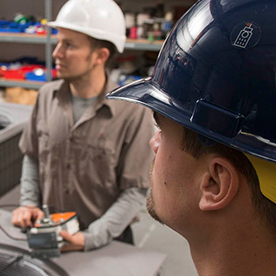 Additionally, our Red Flag Recognition Program fosters safety on the job: each time an employee demonstrates safe behavior, he or she receives public acknowledgement via a sticker for their Reitmeier hardhat. Keeping safety at the top of everyone’s mind improves our work and creates an environment in which employees can feel comfortable. What matters to our employees, matters to Reitmeier. And since many of our employees put family first, we aim to make the connection between work and home as smooth as possible. If one of our employees is working in the field and needs to attend a child’s soccer game after a job, he or she can use the company vehicle. Or, if one of our office staff has to attend to a sick child, he or she can work from home that day. Ready to be a part of Reitmeier’s thriving culture? Explore our open career opportunities.